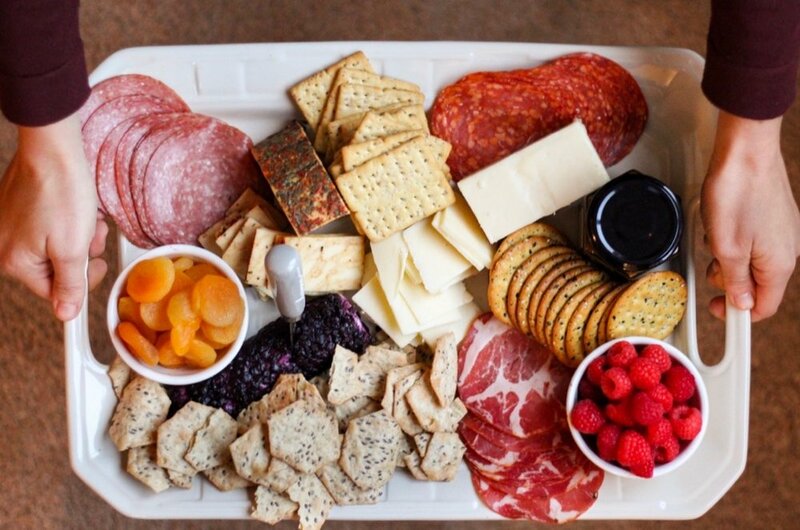 One of my favorite things to have for guests or to bring over to a friend’s house is a charcuterie board. They are so beautiful and have a variety of options that each one of your guests is bound to love! I love to do two hard cheese and at least one spreadable soft cheese. My go-to spreadable soft cheese is Trader Joe’s Blueberry Vanilla Chevre. For my hard cheese, I almost always go for a white cheddar (which is a crowd pleaser) and a smoked gouda. Any of your favorites will do here! Cheese pairs well with sweet things like honey, fig jam, or a chutney. I also love to include fresh fruit of some kind, usually whatever is in season. In the summertime it is usually strawberries or raspberries, and in the wintertime it is usually a sliced pear or apple. I also love having a dried fruit element incorporated. Dried apricots are my go-to! I love to add nuts or a savory spread like stone ground mustard to balance out the sweet spreads. Include a bowl of olives! Always have a variety of cured meats. It is the main attraction on your board. I always go for peppered salami and prosciutto! Choose a variety of crackers of a fresh-baked baguette. I always make sure one of these options is gluten free for your guests! Arrange all of these elements on your favorite platter or cutting board! I always bring my own charcuterie serving tray and cheese knives. I also like to create height by adding in 2 or 3 little bowls for the fresh fruit, dried fruit and nuts. Your guests will be more than impressed with your beautiful spread! Pro Tip — buy your cheese at Aldi. They have a variety of options and are very reasonable in price!